Music: Music appreciation & weekly entertainment. Exercise: Stretching exercises, fitness center, mall walking, nature walks, action games, and gardening. Manicures: Offered weekly at no cost to you! Shopping: Two times a week at local department, discount, and grocery stores in our wheelchair-accessible van. Worship: Bible study, Catholic communion, in-house and off-campus church services, visits from community church groups, and hymn-sings. Lunch out: Join us as we visit a local hot spot for lunch twice a month (Black Diamond Bakery, Applebee’s, Trotters, Mitzel’s, Red Robin, etc.). Ice Cream Socials: Join us every other week for this tasty get-together! Wine & Cheese socials: Once a month we chat and have a good time sipping wine and tasting a variety of cheeses. 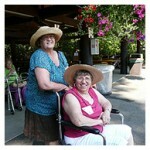 Other Outings: Mariner games, Museum of Flight, Tacoma Glass Museum, Snoqualmie Falls, Puyallup Fair and more!